My mother and I were at the dry cleaner's, standing behind a woman we had never seen. "A nice-looking woman," my mother would later say. "Well put together. Classy." The woman was dressed for the season in a light cotton shift patterned with oversize daisies. Her shoes matched the petals and her purse, which was black-and-yellow-striped, hung over her shoulder, buzzing the flowers like a lazy bumblebee. She handed in her claim check, accepted her garments, and then expressed gratitude for what she considered to be fast and efficient service. "You know," she said, "people talk about Raleigh, but it isn't really true, is it?" The Korean man nodded, the way you do when you're a foreigner and understand that someone has finished a sentence. He wasn't the owner, just a helper who'd stepped in from the back, and it was clear he had no idea what she was saying. "My sister and I are visiting from out of town," the woman said, a little louder now, and again the man nodded. "I'd love to stay awhile longer and explore, but my home--well, one of my homes--is on the garden tour, so I've to get back to Williamsburg." I was eleven years old, yet still the statement seemed strange to me. If she'd hoped to impress the Korean, the woman had obviously wasted her breath, so who was this information for? "My home--well, one of my homes": by the end of the day my mother and I had repeated this line no less than fifty times. The garden tour was unimportant, but the first part of her sentence brought us great pleasure. There was, as indicated by the dash, a pause between the words home and well, a brief moment in which she'd decided, Oh, why not? The following word--one--had blown from her mouth as if propelled by a gentle breeze, and this was the difficult part. You had to get it just right, or else the sentence lost its power. Falling somewhere between a self-conscious laugh and a sigh of happy confusion, the one afforded her statement a double meaning. To her peers it meant "Look at me, I catch myself coming and going!" And to the less fortunate it was a way of saying, "Don't kid yourself, it's a lot of work having more than one house." The first dozen times we tried it, our voices sounded pinched and snobbish, but by midafternoon they had softened. We wanted what this woman had. Mocking her made it seem hopelessly unobtainable, and so we reverted to our natural selves. "My home--well, one of my homes..." My mother said it in a rush, as if she were under pressure to be more specific. It was the same way she said, "My daughter--well, one of my daughters," but a second home was more prestigious than a second daughter, and so it didn't really work. I went in the opposite direction, exaggerating the word one in a way that was gauranteed to alienate my listener. "Say it like that and people are going to be jealous," my mother said. "Well, isn't that what we want?" "Sort of," she said. "But mainly we want them to be happy for us." "But why should you be happy for someone who has more than you do?" "I guess it all depends on the person," she said. "Anyway, I suppose it doesn't matter. We'll get it right eventually. When the day arrives, I'm sure it'll just come to us." 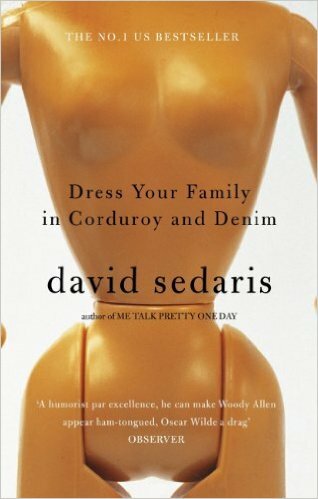 David Sedaris returns to his deliriously twisted domain: hilarious childhood dramas infused with melancholy; the gulf of misunderstanding that exists between people of different nations or members of the same family; and the poignant divide between one's best hopes and most common deeds.